Be SMART – Price compare! Silver is one of the most well sought after precious metals in the world. Government Mints, like the US Mint and Royal Canadian Mint, precious metals refineries, and private coin minters make high quality silver coins, bars, and bullion available as an investment-grade commodity. Buy silver bullion at incredibly low, wholesale prices at Coin Collecting Enterprises to take advantage of the silver bullion market while prices are, as many believe, manipulated to be lower than they truly should be in reality. The well believed manipulation is based upon the fact that an unbelievably and exponential amount of paper silver stock and ETFs exist on the world stock market exchanges significantly greater than the world’s supply of silver. Meaning that if every owner of silver in the stock market called for physical delivery of their silver, the market would crash as stock brokerage companies could not delivery said silver. What does this mean for you? Silver mining companies and large physical silver bullion holders are getting fed up with silver price being manipulated. One can see in today’s market the vast demand for physical precious metals like gold and silver has grown so much so that many precious metals dealers are actually out of stock. This means you can buy physical silver coin bullion at heavily discounted pricing knowing demand has grown incredibly before it’s too late, the manipulation game ends, and prices speculatively skyrocket. The disparity in pricing between paper and physical silver is blatantly growing faster and faster. This is easily seen by bullion brokers and sellers constantly selling out of their silver inventories. There is a strong premium and demand for 90% US silver coins over pure rounds, bars, and other silver bullion products. Buy your silver bullion coins now before they become a rare value and expensive item. Silver Bullion coins are much more scarce than other forms of silver like bars, various jewelry (usually sterling silver), and other forms including raw silver ore. The rarity has to do with finite quantities minted, usually by governments. Though you can still buy newly minted pure (approx. .999 pure) silver American Eagles and other minted coins, there’s a huge demand for the U.S. Mint 90% silver coins minted 1964 and older (with the exception of the half dollar silver coins that were minted up until and including 1970). The 90% silver U.S. coins are hugely sought after and are frequently selling out at various online precious metals sellers. The finite quantity minted crates a collectible rarity, while the ease of recognizing the U.S. coin denominations like, nickels, dimes, quarters, half-dollar coins, and dollar coins make them have the perfect market recognition. Market recognition of precious metals like silver is incredibly important as it means that buyers know exactly what they are buying by visually recognizing the coin type and year the coin was minted. In addition, because the silver coins were minted by the United States Mint, buyers of precious metals know the quality is a near certainty that when they buy, for example, a 90% silver Roosevelt dime, they’re getting exactly that, a 90% silver Roosevelt dime. This market recognition is exactly why silver in coin form will fetch much higher premiums above silver spot price when selling silver. 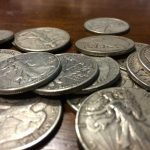 Historically, when demand for physical silver rises, one tends to make a greater profit on their investment with silver coins versus silver bars, rounds, or other forms of silver. Silver bars is another smart way to buy silver bulk and cheap online. Unlike 90% silver coins, silver bars tend to be 99.995 to 99.999% pure silver and are cheaper than their 90% silver coins counterpart compared to silver spot price. Silver bars should be stamped for authenticity from their respective manufacturer or metal refinery which consists of a security serial number, their weight and finess, as well as sometimes an actual security seal around the silver bar itself. Buying silver rounds is another silver investing method. We do not advocate or advise buying silver rounds as they tend to be more of a gimmick and overvalued compared to their actual silver price. Private metal refineries and private mints tend to stamp silver rounds with trendy images. Though the silver round itself is still usually a pure silver quality, the investor pays extra for the stamp, which holds only a collector appeal. Unless you are certain this collector silver stamp appeal for your silver round is going to appreciate in value, it is more advisable to buy 90% silver coins, or even silver bars. One way a silver round can appreciate in value due to its particular stamping is numbered limited releases, particularly buying government programmed mints like the United States Mint. There are silver round releases (just like gold round releases) with limited quantities and special releases that some silver coin collectors find very desirable. This is one of the few exceptions where paying an extra premium for the silver round may be advantageous. Silver prices today can be highly volatile in the short term. If you, as a buyer/investor are trying to make a quick dollar on buying and selling silver, it could be very difficult without the ability to buy low and sell high. This is because most brokers who buy silver, such as coin and precious metals dealers, are doing the exact same thing – buying low and selling high. Unless you have access to the consumer market at low cost, you will have to buy low enough where you can sell at a price minus cost for a profit. Such cost when selling silver for silver price would be fee commissions on sites like eBay or Amazon, as well as shipping, and merchant services payment systems like PayPal. So when working with silver price, it is advisable to think long-term. Silver prices long-term are key to successful silver purchasing. Silver price is speculatively very low compared to where it should inevitably be. The thoughts, though definitely speculative in terms of how long it will take for a price rise, are that the cost to mine silver out of the ground may rest around $22-$23 per ounce. So if the price of silver in the futures market is less than that, then there will be pressure on silver mining companies to shut down. Silver supply would drop and therefore silver price should rise.